Complete UAH v6.0 data for December for all regions were released yesterday- sooner than I expected! Here are graphs for the remaining regions showing the furthest back one can go to show a zero or negative trend (less than +0.01C/ 100 years) in lower tropospheric temperatures. (See my previous post for Global, Southern Hemisphere, and Tropical regions). Note: The satellite record commences in December 1978. The entire satellite record is now 37 years 1 month long- 445 months. The Pause has lengthened again, by 10 months. 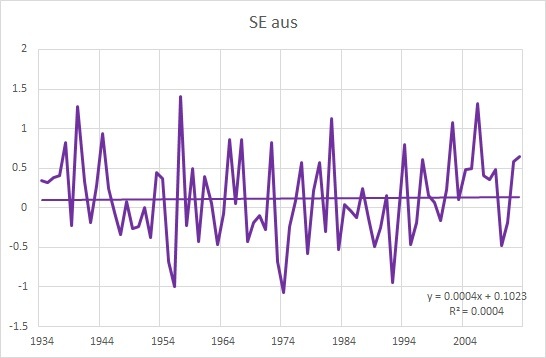 For the whole of the satellite record, the South Polar region has had a negative trend. So much for a fingerprint of warming due to the enhanced greenhouse effect being greater warming at the Poles! 18 years and 11months. So the Pause hasn’t disappeared- it’s just hiding in the ocean! In my next post, later today or tomorrow, I’ll compare Land and Ocean data for various other regions. 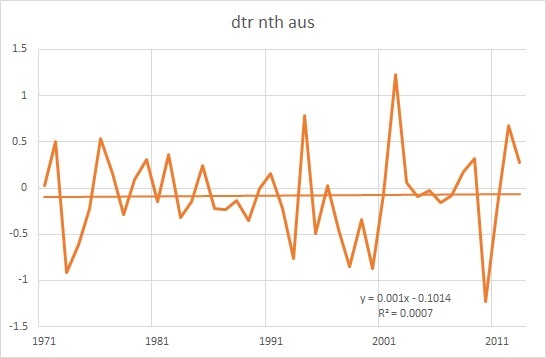 I’ve been banging on about DTR in Australia for a while, showing that as an indicator of greenhouse warming, decreasing DTR trend has been lacking from Australian records for some time, such that the trend is flat since 1947. DTR is Diurnal Temperature Range, the difference between Minimum and Maximum temperature daily. Several previous posts discuss this. Greenhouse gases slow back radiation, and thus night time temperatures are expected to be warmer than normal, and minima are expected to increase faster than maxima, so DTR should decrease. I’ll now show what is happening on a regional basis. 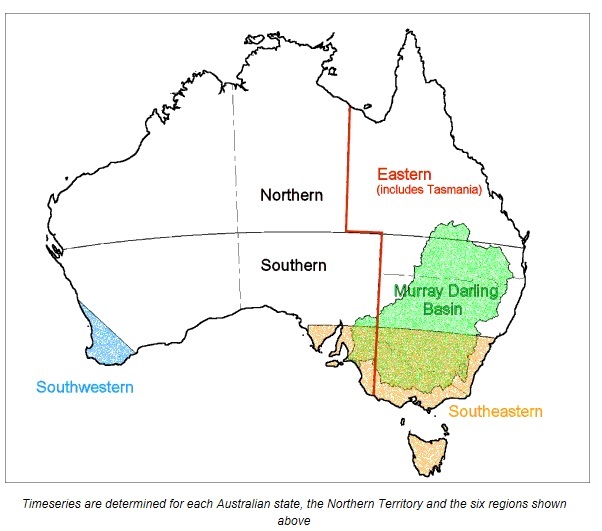 This map shows the main meteorological regions of Australia. The main difference is between Northern Australia and Southern Australia. 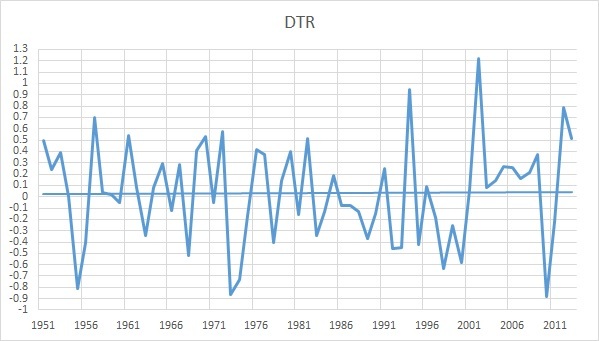 43 years of flat trend in DTR! 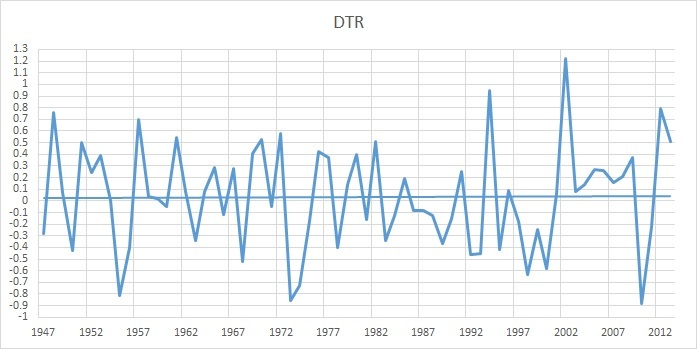 That’s right, in South-East Australia, the DTR trend has been flat for 80 years! Braganza et. al. 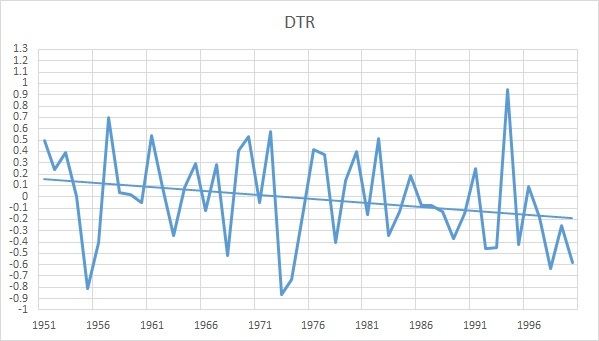 analysed global DTR from 1951 to 2000, finding a significant decline of ~0.4 degrees C. If we compare Australian data for the same period we find this is corroborated. The observed decrease over this period is ~0.35 – 0.4 C.
With the benefit of an extra 13 years of data, we can check whether this continues to be the case. No Excess Winter Warming for 103 Years! Another key indicator of greenhouse warming, a pattern of temperature change “uniquely associated with the enhanced greenhouse effect” according to Dr Braganza, is greater warming in winter compared with summer. 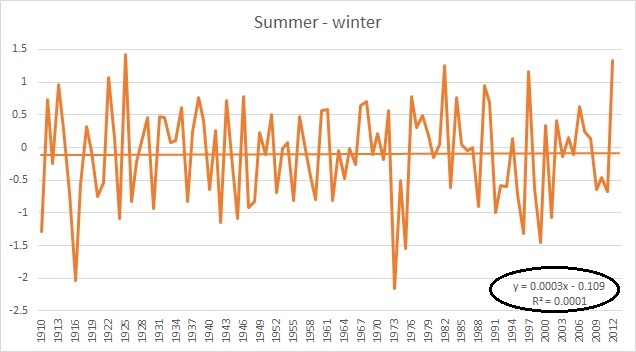 This is a graph of summer annual means minus winter annual means for the years 1910 – 2012, straight from BOM’s time series data. No winter increase over summer in 103 years. This summer- we find out in early March- will have to be less than +0.7 C above average to make the trend ever so slightly negative (to 5 decimal places). But then how will we get another “Angry Summer”? No Evidence of Greenhouse Warming for 67 Years! The release of 2013 data by the BOM has provided me with plenty to work on. 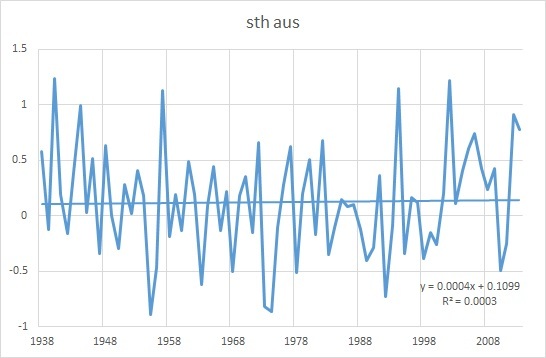 Various commentators are busily alarming people by claiming that the hottest year on record is an indication that global warming due to the enhanced greenhouse effect is already impacting Australia. 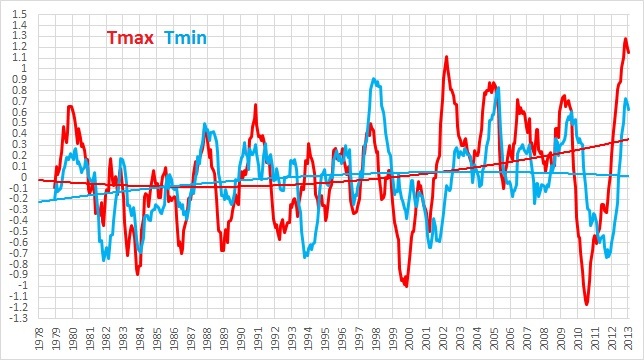 What is most disappointing is that the BOM has done nothing to report the truth: that while Australia has definitely been warming, and breaking records, the data show no evidence of greenhouse warming. One of the key indicators of warming uniquely associated with the enhanced greenhouse effect is night time temperatures (minima) increasing faster than daytime temperatures (maxima). The difference between the two is called the Diurnal Temperature Range, or DTR. So, decreasing DTR would be evidence of greenhouse warming. That’s dead flat or slightly rising for 67 years! I couldn’t believe it either, and double checked. 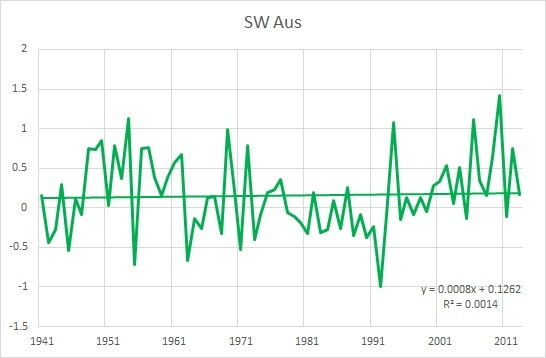 There’s no mistake- DTR shows no evidence of greenhouse warming in Australia, with a flat trend for 67 years.